Outdoor director extraordinaire Jimmy Chin films the unthinkable in the Oscar-winning documentary Free Solo. 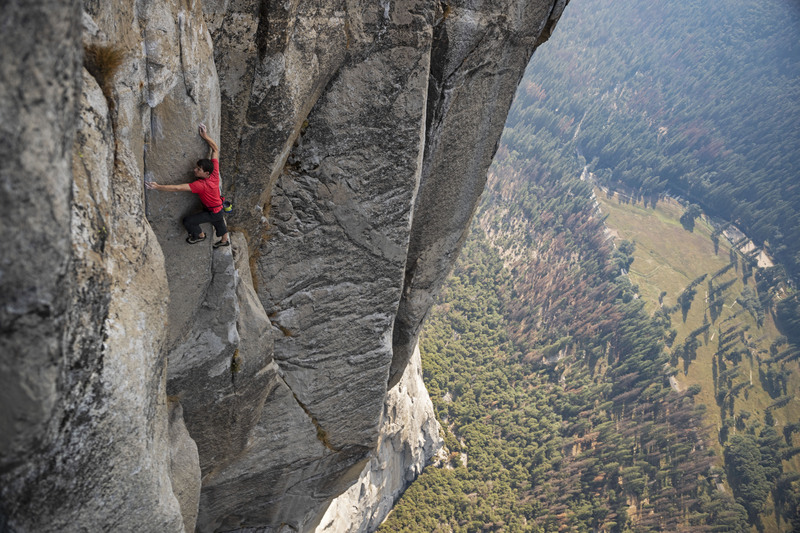 In the film, Chin documents the free solo climb of El Capitan by Alex Honnold. In layman’s terms: he films a real-life Spider-Man climb the 3,600 ft. sheer granite slab of what is arguably the most difficult wall in all of climbing: with no ropes or assistance. If your palms aren’t already sweating, watch the trailer below. Both Chin and Honnold make much of El Cap, each using it as their artistic canvas. Chin’s visualization of the rock face is breathtaking as he simultaneously portrays its beauty and the seemingly impossible task of a free solo ascent. And then there’s Honnold, whose lanky appearance makes him look like his sole purpose in this world is to climb things. And so he does, often considering the ropes climbers have used since forever an optional adage. His art is calculated insanity, giving himself wholly to each hold by perfecting it through training, writing about it in his climbing journal, and practicing the routes of El Cap (with ropes) as he prepares for his free solo climb. Almost any adventure documentary will make the casual outdoorsman long for the freedom of the wilderness. And Free Solo is no different as Honnold models the minimalist lifestyle while Yosemite doubles as his playground. If there ever was a person to free solo such a behemoth rock face, it’s Alex Honnold. Not only a skilled climber, Honnold’s mental awareness and fortitude may be the most impressive skill in the repertoire needed for such a feat. Like any free solo climber, Honnold knows the risks associated with the sport, the most notable (and likely) being death. Even with the risks, Honnold is unphased and in some ways, his perspective in death is refreshing – people die, it’s inevitable. But his perspective, like his gnarled, giant hands is far more calloused the closer you look. Honnold’s relationship with his girlfriend, Sanni McCandless, adds a layer of difficulty for mental preparation. Still trying to remain determined and calculated, Alex now has to think about how his climb affects others: Sanni’s presence adding a level of emotional strain. She tags along with him on climbs, bunks up in his van-turned-home, and becomes a pleasant surprise to the recluse climber. But still, her proximity to Alex reveals that for him, climbing always comes first. Alex’s skill as a climber and athlete is something to behold. But despite his effortless movement on and up the rock wall, Free Solo shows the restrictive straightjacket of climbing Alex dons as his second skin: though he’s rarely bound by rope, I’d wager that the last thing Alex Honnold is, is free. Saint Augustine thought that what we love shapes everything else. And love, the deeper it is, the more it requires. For Alex, his sacrifice at the altar of climbing yields simple living, beautiful vistas, and a warrior mindset. He is a bonafide badass with a mind like a titanium trap who will do anything to reach the summit. But Alex’s love requires the sacrifice of far more than his time and body. His commitment to the rock means that other relationships are also placed on the altar. And they can only watch as Alex willingly places himself in the soft mouth of death; fearing that his adventure won’t end in conquering El Cap but him falling through the frame as his film crew helplessly watch from thousands of feet below. But Honnold doesn’t fall, his film crew doesn’t capture his death, and Sanni answers the anticipated call from Honnold as he stands atop rock climbing glory. At the sound of his voice, Sanni cries. Along with Sanni, Chin cries, the film crew cries, and even Honnold almost cries as he sits atop his granite throne. I wonder what was at the root of Honnold’s emotion. I wonder if all of those tears, or the tears that almost fell from Honnold’s eyes were because he was simply still alive. His sigh of relief a thank you to a demanding love that found him, at least this day, worthy; his tactical, disciplined, and calculated training enough to balance the scales of death, if only for a time. At the end of the day, Free Solo is a layered masterpiece about a man who summits the pinnacle of climbing glory. And while usually free from ropes, Honnold is tightly bound by his climbing passion regardless of what its demands. Poet W. H. Auden once said “Nothing can save us that is possible. We who must die demand a miracle.” I pray Honnold’s love supreme won’t be the death of him.